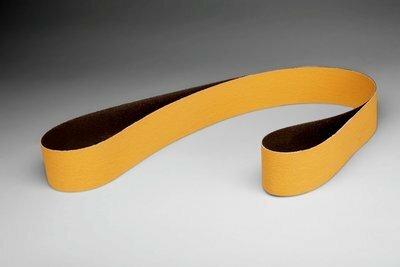 2'' x 72'' Cloth Belt 967F, Ceramic - 36 Grit - Lot of 50 by 3M at In The National Interest. MPN: 60440331837. Hurry! Limited time offer. Offer valid only while supplies last. 3M coated 967F sanding belt uses ceramic as the abrasive material. 3M incorporates this ceramic material into the sanding belt forming a grit of 36. 3M coated 967F sanding belt uses ceramic as the abrasive material. 3M incorporates this ceramic material into the sanding belt forming a grit of 36. This particular 3M sanding belt is 2 in wide by 72 in long. This abrasive is on a cloth backing, YF weight.